I remember thinking a few months ago that I missed the writing of authors like Venise Berry. Then I re-read Colored Sugar Water during a read-a-thon and wondered what exactly it was that I was missing. The book was okay, but I think I oversold myself on the story line before. Maybe I liked her other books, So Good and All of Me, but this one? I found myself giving it the ultimate side eye on several occasions. 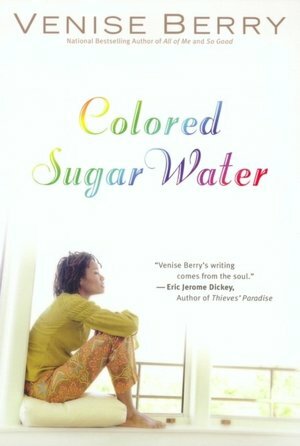 Colored Sugar Water is Lucy Merriweather's story. The granddaughter of a Louisiana healer, Lucy believes in a little of everything, from fortune telling to voodoo to God. Lucy, the regional manager of a successful chain of fitness centers, is stuck in a stable, but boring, relationship with Spencer, a McDonald's franchise owner. Spencer is dependable, but far too predictable for Lucy. Adel Kelly has been Lucy's best friend since their college days. Married to Thad, who's always on the brink of the next great idea, Adel is tired of carrying the weight of their household on her shoulders. At her age, she should be thinking about having babies, but if Thad doesn't get it together, she'll be raising any future kids as a single mother. When the two happen across a late night commercial for psychics, Lucy dares to call the number, even as Adel warns her not to. Before she knows it, Lucy is caught up in a whirlwind romance with Kuba, the man that answered the phone, and Spencer and Adel are both losing the Lucy they used to know. This book started off fairly decent and then it evolved into Christianity versus voodoo versus the supernatural. It just didn't work for me. I prefer to keep my genres separate. I know that when I pick up a Tananarive Due book, I'm going to get vampires and what not. When I picked up this book, there was no indication that Venise Berry was going to try to take me there. If I had realized that before I started reading, I probably wouldn't have picked it up.